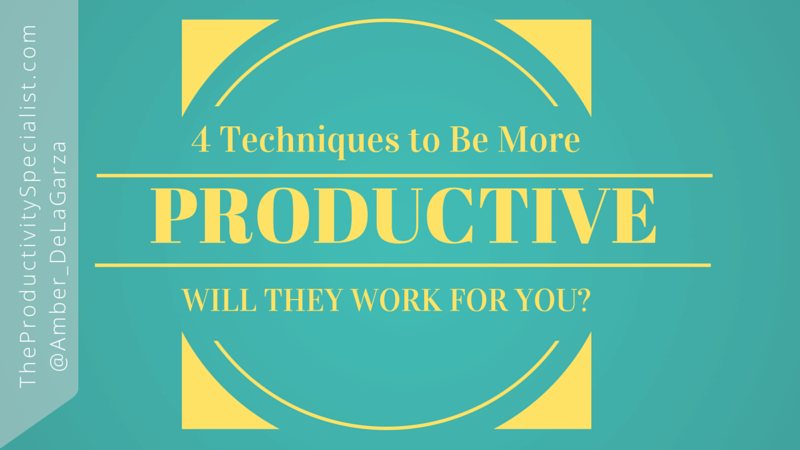 Have you ever woken up in the morning or stayed up late pondering the question How can I be more productive? Probably not. Instead, most people ask themselves questions along the lines of, How can I find more time? How can I get caught up? or How can I possibly get all my work done? As you search for the right answers you can easily be overwhelmed by all the information you come across including the numerous promises that a “productivity hack” or “productivity tip” will fix your problems and magically make you more productive. The truth is you need to find what works best for YOU which is going to be different from what works best for your colleagues or employees! We need to recognize and appreciate our individuality. Through my years of training and consulting with all sorts of entrepreneurs, associations, and corporations, what has become abundantly clear is that what works for one person does not work for everyone and possibly not anyone else. Just like a stylist recommends you dress for your body type, I suggest you strive to work in whatever unique way best suits you. There’s a myth that there are standard rules we all have to follow when it comes to how we should work, reach for goals, and pursue success. As you read any article on the topic of productivity, I urge you to ask yourself, What will work for me? Not every “productivity solution” will work for you so don’t waste valuable time trying to squeeze each round-shaped solution into your square-shaped workflow. Many of my clients feel frustrated after what they were told works does not. The fact is the productivity technique they tried just wasn’t right for them but there are other techniques that certainly are a good fit. I aim to share a plethora of different productivity techniques, strategies, and tips to give you choices, knowing full well that some may work for you while you should purposefully forget the rest. 13 Productivity Tips for the Busy Professional below was created by Hubspot Blogs. The infographic provides a variety of tips on how to plan and organize your time, optimize your workspace, improve your personal care, and use productivity apps. I recommend selecting one or two of the tips that you can foresee working well for you and implementing them into your routine. Be honest with yourself and ask, Will I be able to follow through with this tip so it can aid me in becoming more productive? Commit to ones you will actually use or they will have no chance of working. If you want to transform the way you work so you can reduce stress, maximize time, be more productive, and grow your business, I invite you join our Productivity Community where like-minded ENTREPRENEURS Learn, Connect, and Encourage each other to take consistent, massive, focused, action in business!